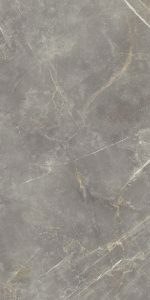 What catches my eye in this series is that terrazzo deco (shown above)! 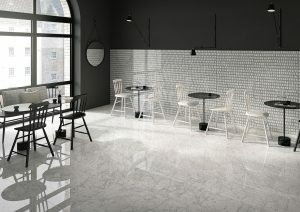 The deco is incredibly realistic looking – you can see the fine aggregate of the concrete that encompasses the irregular blocks of Statuario. 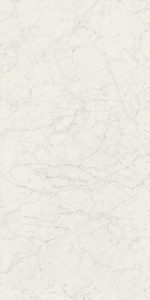 The marble-look porcelain tile that accompanies the terrazzo-look is of the same caliber of realism. 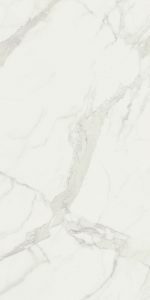 The palette is composed of white marbles – Gioia, Statuario, Calacatta; along with an Imperial Grey and Port Laurent. I love the look of the terrazzo panels on the wall. From a distance it gives the wall a textural effect (see image above), but as you get closer, you begin to see the individual blocks. It’s an interesting visual effect. 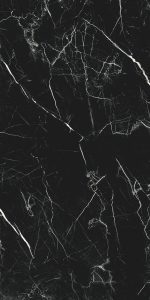 The unique features of this collection are: skip sawn treatment of the wood and option of a solid body stain or pickled finish in black, grey and white. The skip sawn detailing of this wood-look takes on different characteristics when it is finished with a solid body stain versus when it is pickled. It allows you to choose the level of “rusticness” you need for your project. 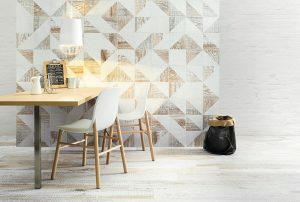 This collection would work great in a cocktail bar or restaurant looking to achieve an industrial feel, or any space that could benefit the warmth of wood with the durability of porcelain tile. The 8″x8″ decos can be used together to create unique insets or used as wayfinding through a space. 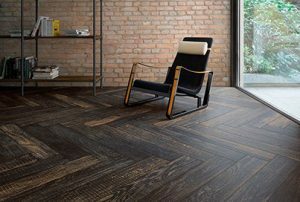 I could also see these being used as a transition between the solid planks and the pickled planks.